Serbian History 101 - Serbian recipe samples: Prijatno! Enjoy! 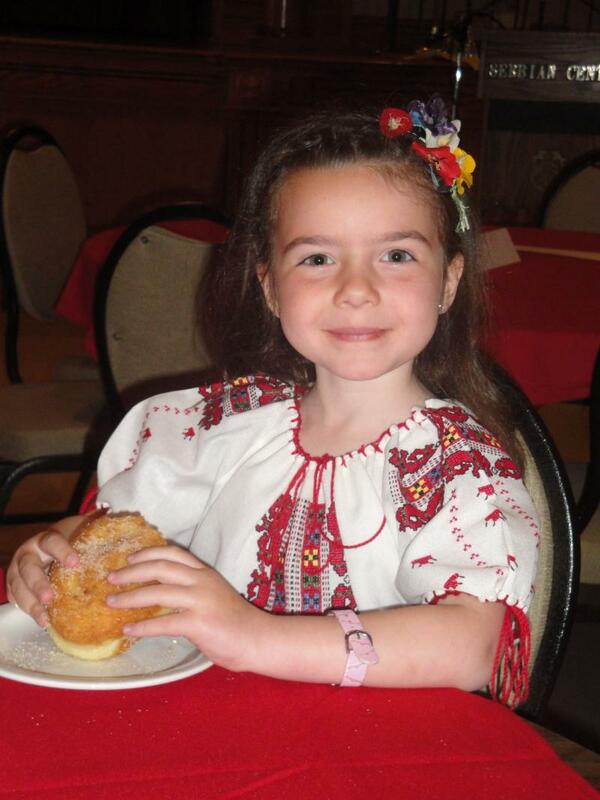 Georgiana, granddaughter of George Velikovich, enjoying a "krofne"-A Serbian donut! Our Babas made the krofne much larger, but in these photos below, I just used a donut cutter... 1/2 size of the above beautiful donut Georgiana is holding! Teti Ljubi's recipe--- Teti Ljubi dreamed of coming to America and made the beautiful flag I have with the double-headed eagle and the crossed American and Serbian flags shown elsewhere on this website. Then she and her husband, Stevo Bijelic, lived in Ambridge, PA, USA for 20 years, admidst close relatives. Ljubi worked in Paul's Bakery and Stevo worked at the Sewickley Cemetery. They saved their money and each month sent money back to Gornnji Sjenicak, Vrgin Most, where they had a beautiful home built for their retirement. Stevo helped take care of many of the villagers there and enjoyed a nice status before he passed away. Unfortunately Teti Ljubi was one of those Serbs that had to flee in "Operation Storm" on a tractor, with nothing but her purse, joining 250,000 others cleansed from the new Croatia. She has since passed away, but her memory is eternal. I always used butter instead. Crisco or vegetable oil should be heated about 20 minutes so it sizzles when you drop the dough in. Let brown on one side, and then turn once to finish.... Drain oil. Cover with sugar and "Ummm, Ummm!" Good! Serbian recipe samples: Prijatno! Enjoy! Georgiana, granddaughter of George Velikovich, enjoying a "krofne"-A Serbian donut! 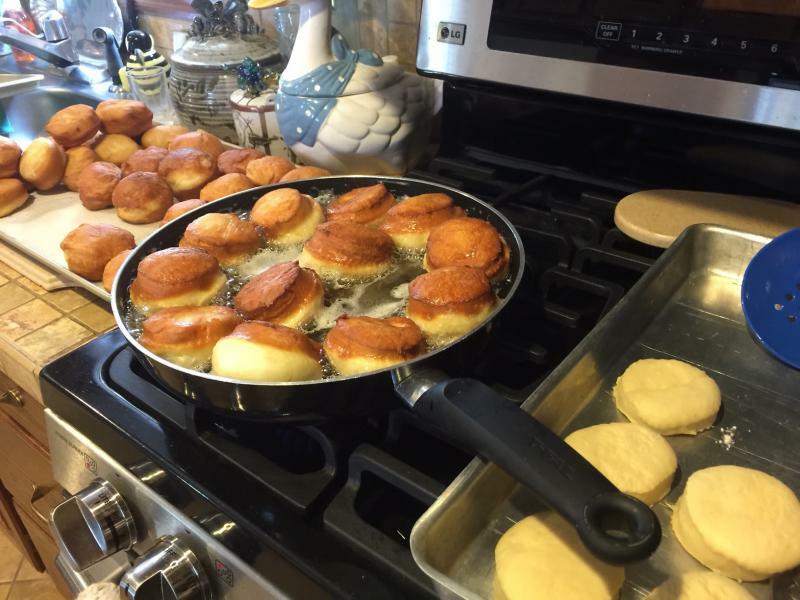 Our Babas made the krofne much larger, but in these photos below, I just used a donut cutter... 1/2 size of the above beautiful donut Georgiana is holding! Teti Ljubi's recipe--- Teti Ljubi dreamed of coming to America and made the beautiful flag I have with the double-headed eagle and the crossed American and Serbian flags shown elsewhere on this website. Then she and her husband, Stevo Bijelic, lived in Ambridge, PA, USA for 20 years, admidst close relatives. Ljubi worked in Paul's Bakery and Stevo worked at the Sewickley Cemetery. They saved their money and each month sent money back to Gornnji Sjenicak, Vrgin Most, where they had a beautiful home built for their retirement. Stevo helped take care of many of the villagers there and enjoyed a nice status before he passed away. Unfortunately Teti Ljubi was one of those Serbs that had to flee in "Operation Storm" on a tractor, with nothing but her purse, joining 250,000 others cleansed from the new Croatia. She has since passed away, but her memory is eternal. I always used butter instead. Crisco or vegetable oil should be heated about 20 minutes so it sizzles when you drop the dough in. Let brown on one side, and then turn once to finish.... Drain oil. Cover with sugar and "Ummm, Ummm!" Good! Baba Mim's Christmas 2010 table above. All the Volitich members help V.Rev. Fr. Stepanov turn the Slava kolach. This way, you're showing UNITY as a family, and remembering all those members who have since passed on, to guard your Slava and keep those traditions alive. ++++++++++++++++++++++++++++++++ Everyone loves Djuri Volitich's CICVARA. But this time, we're going to give credit to Marlene Powell, of Boonesboro, who had this recipe published in the HOME COOKING section of The Herald-Mail. Marlene belongs to the St. Catherine Eastern Orthodox Church of Hagerstown. 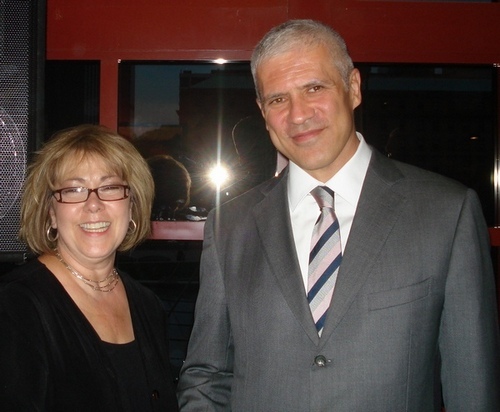 "I am third-generation Serbian, and I was born into the Orthodox faith. "This traditional Serbian recipe, cicvara (pronounced "SEETS-vuh-ruh," rolling the R), can be found as a side dish at any special meal to celebrate a festive day at church or at home. 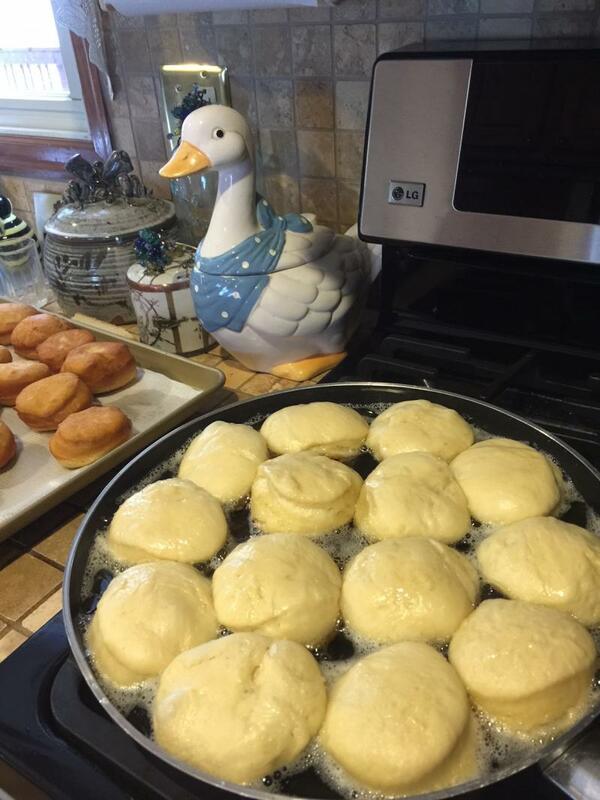 "This recipe was given to me by a Serbian family at our original home parish of St. Luke Serbian Orthodox Church in McLean, Va. Every year I would delight to see my favorite dish on the buffet line at church. I finally remembered to get the recipe. "Now I include it for special events at St. Catherine Eastern Orthodox Church in Hagerstown. "The secret to this traditional Serbian dish is to carefully monitor boiling and to stir often. Combine milk, 1 cup sour cream, butter and salt in a saucepan over low heat. Bring to a boil. Add cornmeal, a little at a time, carefully monitor boiling and stir frequently until thick. Cover, lower the heat and let simmer 30 to 45 minutes until entire mixture starts to float in butter. Transfer to an 8-inch-by-8-inch casserole dish. With remaining sour cream, spread a layer on top (like icing) just before serving. Serve warm. Cook's note: Double or triple the recipe if serving in a large casserole dish. — Courtesy of Marlene Powell, who is a member of St. Catherine's Eastern Orthodox Church in Hagerstown. In large mixer bowl, stir together 1 1/2 cups flour and the yeast. Heat milk, sugar, butter and salt just until warm, stirring constantly until butter almost melts. Add to the dry mixture in mixer bowl; add egg. Beat at low speed on the electric mixer for 1.5 minutes, scraping the bowl constantly. Beat 3 minutes at high speed. By hand, stir in enough of the remaining flour to make a moderately stiff dough. Turn out onto large floured cloth; knead for 6-8 minutes. Place in greased bowl, turning once and let rise until double, about an hour. Punch dough down, cover and let rest 10 minutes. On floured cloth, roll dough to 1/4 inch thickness, about 25 x 10 inches. Stretch gently, working from center to edges, pulling very thin, to about 30 x 20 inches. Spread with the filling. Starting at the long side, use cloth as guide to rollup dough jellyroll fashion. Pinch edges to seal. Place one end of roll in center of large greased baking sheet. Coil the dough to make a snail-shaped spiral; seal end. Cover and let rise in warm place until nearly double, about 30-45 minutes. Bake in a 350 degrees over 30-35 minutes until brown. Put the ingredients in a 16qt stalk pot and bring to a boil. Simmer for 3 hours or until beans are soft. Make zafrik: heat oil in a pan with 1 cup flour and mix until brown - slowly add to pot and it will thicken. You can add seasonings to your taste. i like to add some vegeta as well. "I didn't not feel i was doing posti-ing any justice after I made this. I ate bowl after bowl afte bowl. I felt like I was at my +grandmother's and she made it! I was so excited. Sorry it's not smaller in size. Not sure how to cook small. Does any Serb? :)"
And here's Lenten Vegetable Cream Soup from her friend, Tomislava Andjelic, also from FACEBOOK. Cook together vegetables in water until tender. Blend in food processor, addiing water if too thick. Return to pot and continue cooking for a short time. Add a tablespoon of Vegeta, salt and pepper to taste before completely cooking. When serving, sprinkle chopped parsley. And you need to have a dessert to go with those Lenten (Posno) meals. Well, Milica Babir-Manojlovic sent this one to Alexis' Facebook Posno Recipe page and it sounds so great! "Actually my birthday is September 27 (Krstov dan) a fast day.. This is my birthday cake(-: Make it every year!!" Meet 10 year old Alyssa Shorak (shown here in the middle with her two good friends, Noel and Megan. Alyssa Shorak, fantastic cherry pie maker! It was at the Shorak Slava of St. Stephan (January 9th, 2010, where I was first treated to probably the best cherry pie I ever tasted. Alyssa's Baba, Patty Perenovich Shorak from Midlland, couldn't be prouder of her talented granddaughter. "I just showed her two times before, and now she does all this cooking herself! She can even double/triple it with ease, with no one helping. She's a tremendous little baker!" Alyssa has played soccer for many years and loves playing her position of Goalie, the hardest position of all, I think! She has taken piano lessons for 4 years now and is a member of Jedinstvo Tammies in Pittsburgh, where she's learning the Prim. Her Dad, Eli, jokes that Alyssa is also learning the trumpet in school, but that she definitely hasn't mastered it yet. ;-) Alyssa loves animals and going to her Baba's farm where her Dad grew up. She started her own garden this year and created her own first tree farm. Try this PIE DOUGH recipe from Alyssa. It's a sure fire winner! 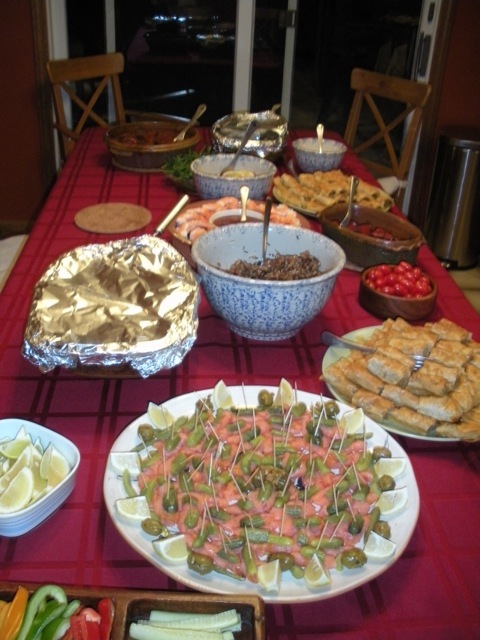 (Alyssa's Baba Patty used to do a lot of catering at the Midland Serbian Club which helps explain such talent!) Too, Alyssa's Mom, Sharon, is no cooking slouch either. She made a tremendous feast for the Slava, though not having a drop of Serbian blood. I say she's 101% adopted Serb! Eli agrees and jokes, "She knows more Serbs/Serbian than I do! She's terrific and does everything!" By the way, I must also mention Alyssa's little sister, Erica, age 8. Erica helped her Dad, Eli, make the Kolach this year. Eli, who has a very important job working at the University of Pittsburgh said of Erica: "She worked quite hard helping me knead the Kolach dough and was so proud when she saw the end result. She literally beamed with pride when Fr. Rajko blessed our family's kolach in Holy Trinity Cathedral!" I can vouch that BOTH girls are darling! Genuine Sweetness oozes from them both! Hvala Bogu! And how Eli got to be the Kolach maker in the family is a story for another time. It's hilarious, though! Mix all together and then freeze for 30 minutes before using. Use Cherry or Peach Pie filling. P.S. The Cherry Pie was the last thing I tasted before leaving the just-like-old-times Slava. There were neighbors and their children of all ages. Best of all was the fact that there at least 3 generations of relatives present on both sides of Eli's family as in the olden days at our house. I felt right at home singing along with Eli's Ukranian Uncle Paul and his Teta Mickey Shorak Hrynewich from Conway in Beaver County. Uncle Paul stopped in the middle of "Ima Dana" to tell me that the years he belonged to Midland's Male Chorus (15 years) were the best years of his life. "All of us were out of work. Instead of just mopping around, we got together and sang and worked for the church. I really enjoyed myself. Only requirements were you had to be at least 55 years of age and wear glasses. AND, we all wore glasses!" Eli's oldest uncle is Rodney (Rade) Perenovich. He came loaded with a huge shoebox (bootbox!) full of interesting papers that he was able to dig out from the Ancestry.com files on the computer. He could trace his great-grandfather coming to the country from an area close to Vrgin Most in present day Croatia (then the Austro-Hungarian Empire) to Canada. From Canada he boarded a train to America where genealogist Rodney literally re-traced the route hoping to find even more info. His great-grandfather then got married in Steelton, before finally winding up in Midland. The late Protonica Pola Tomich's recipe for KOLJIVO. (For Memorial Mass use whole cooked wheat. Wash wheat and cover with water and let soak all night. Drain the next day. Cover with water again and cook until soft. (Sometimes more than 3 hours.) You can also change the water again if you like within this time like I do. Strain cooked wheat and let stand for 1/2 hour. Spread the cooked wheat on clean cloth (or tablecloth) and cover using another clean cloth for about 1/2 hour. Grind 1/2 part of the wheat (if used for the Slava) and then add the rest of the ingredients. Mix well. Put in deep dish or bowl and decorate with powdered sugar and almonds, raisins or nuts or all! People usually use the nuts/raisins to make the sign of the cross on top. Bill Cherry isn't Serbian, but he has written several articles about the Serbs of Galveston. 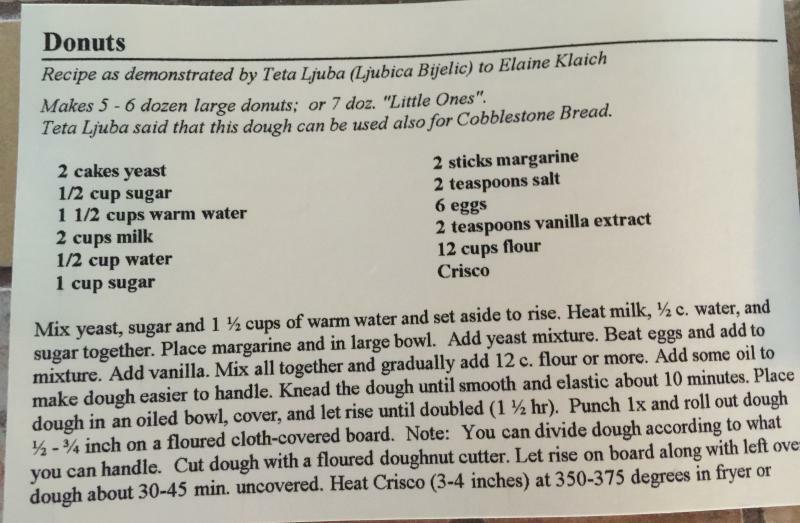 Bill's friend, Elaine Mitrovich, thought our readers might like to try this recipe as Bill says "everyone who has ever had it always asked me for the recipe." Thanks, Bill! Bill, who has also served Texas for 45 years as a realtor, also has a book about the TALES OF GALVESTON for any interested readers! Heat the olive oil over medium heat, then add the onions, garlic and carrots and saute over low heat for 10 minutes. Then add the tomatoes, sugar, tomato paste, chopped basil, chicken stock, lemon juice, salt and pepper. Stir and bring to boil, then simmer for 30 minutes. Add the cream to the soup and then process in a blender until smooth. Reheat the soup when ready to serve. 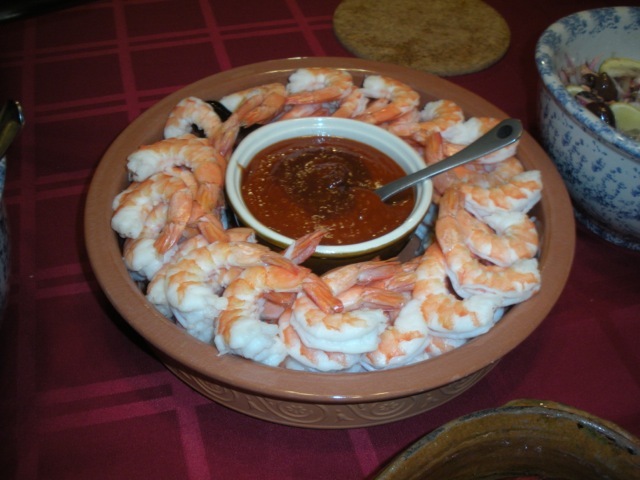 Add generous portions of chopped freshly boiled shrimp to each bowl before serving, then add a splash of sherry or cognac and a basil leaf or two to top each bowl. Put in blender or food processor and WHIP. Note: If too thick, add liquid in same equal proportions to loosen. Betty says you can enjoy with some great bread.....or cooked mashed potatoes! Mix and roll into small balls & place on waxed paper. Melt 1/2 block parafin and 12oz bag of semi-sweet morsels on top of double boiler. When melted lift balls with a toothpick and dip. Use toothpick to dip into chocolate and cover holes....unless you are making 'buckeyes'....leave some pb showing. Like for a wedding! Of a Prince/Princess! 1 cup karo syrup (without the high fructose jazz), put in big pot and turn on low heat....add 1 cup creamy peanut butter and 1 cup sugar, stir til mixed and liquidy...add 6 cups Cheerios (after turn off heat) and stir it up until well-coated. Place on wax paper by tablespoonfuls...can drizzle some dark chocolate icing on top (I bought the kind in the plastic tube that is lenten, but choc full (no pun intended) of chemicals.... EASY PEASY!! Just let it harden like Rice Krispie treats. This was a big hit here! Sift dry ingredients together three times. Put in mixing bowl and add remaining ingredients; mix well. Pour into ungreased 9 x 13-inch pan. Bake at 350 degrees F or until tester (toothpick) comes out clean. Do not over-bake. Sprinkle with powdered sugar when cool or frost with Lemon Frosting. 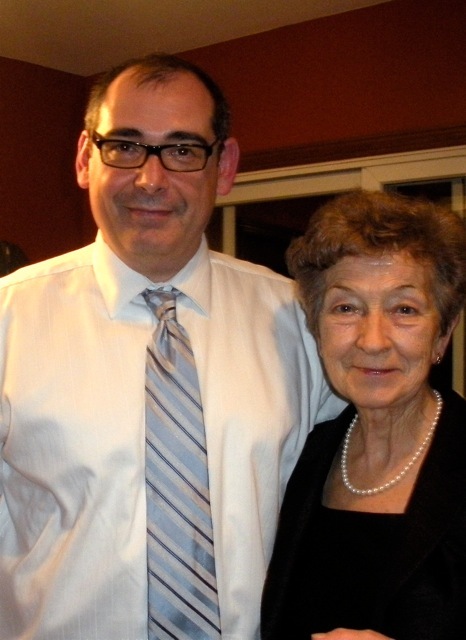 Dr. Miroslav and his mother, 2010, at their Slava. 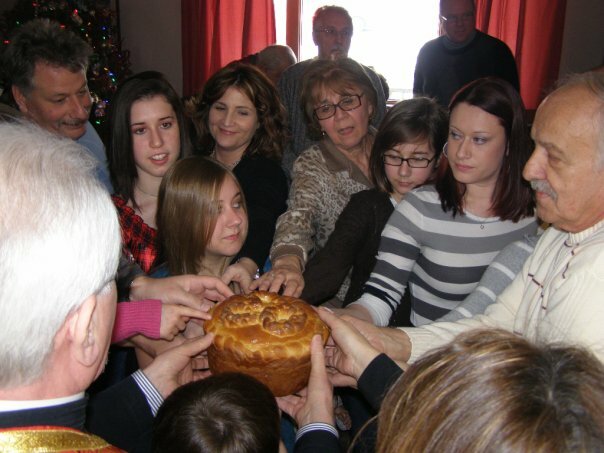 Alisha Hipwell, reporter with the Pittsburgh Post-Gazette, wrote a beautiful story called "Celebrate St. Nick with a Serbian-style 'slava' on Thursday, Dec. 15, 2011. Drs. Miroslav and Divna Djokic celebrate each year with their family and friends at their Franklin Park residence, a suburb of Pittsburgh, PA. Guests fill each room of the house, while children are content to take over the lower level. These are rolled cabbage or grape leaves, but the fasting variant. Divna Djokic says some ethnic and specialty stores sell the whole pickled cabbage leaves in jars or frozen, but you also can substitute grape leaves. Heat olive oil over medium heat in a skillet. Saute onion for approximately 20 minutes or until golden. Add sunflower seeds and rice to onion. Saute 5 minutes. Add seasoning (salt, pepper, paprika) to taste to sunflower seed and rice mixture. Stir to combine. Separate cabbage or grape leaves. Put 1 tablespoon rice mixture in center of cabbage leaf. Roll leaf closed. Repeat with remaining rice mixture and leaves. Place stuffed leaves into deep baking dish. Cover with water. Cover with lid or aluminum foil. Bake at 350 degrees for 2 to 3 hours or until leaves are soft and slightly golden. Divna Djokic's version is vegetarian to comply with the Advent fast. You can top the dish with bacon or sausage. In a large pot, bring lima beans to a boil. Boil 10 to 15 minutes and drain. Add fresh water to cover beans by 2 inches. Bring to a boil. Reduce heat and simmer approximately 2 hours or until beans are tender. Drain, reserving water. Heat olive oil over medium heat. Saute onion slices for 20 minutes or until golden. Add garlic and seasonings to taste to onions. Mix well and sauté 1 to 2 more minutes. Combine beans, onion mixture and reserved water in a deep baking dish. Bake at 375 degrees for 1 hour or until top is golden and water is absorbed. Mix walnuts, raisins and 8 ounces of sugar in a bowl. In a deep dish, place 1 phyllo sheet. Sprinkle with oil. Repeat phyllo/oil layer twice more. Layer next phyllo sheet. Sprinkle with 3 to 5 tablespoons of walnut mixture. Layer next phyllo sheet on top of walnut mixture. Sprinkle with oil. Repeat phyllo/oil layer twice more. Layer next phyllo sheet. Sprinkle with 3 to 5 tablespoons walnut mixture. Alternate oil and walnut mixture layering process until walnut mixture is gone. The last layer should be 3 phyllo sheets sprinkled generously with oil. In the pan, cut phyllo into 1-by-2-inch rectangles. Bake until golden, around 30 minutes. While suva pita is baking, boil water and 1 pound granulated sugar until sugar is dissolved and mixture starts sticking. Add lemon slices. Pour warm sugar and lemon mixture slowly over baked suva pita. 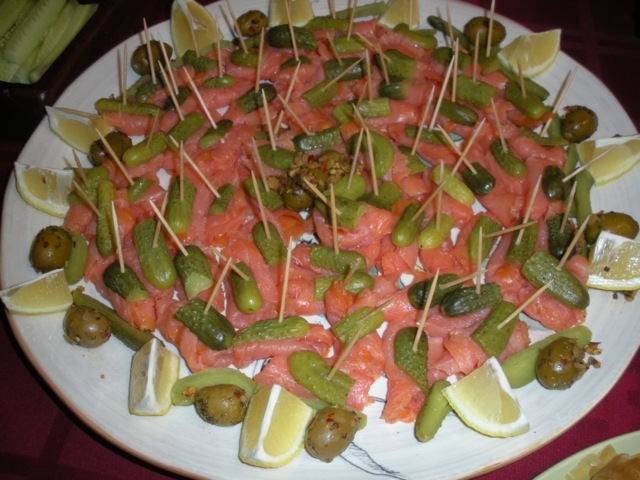 Let stand overnight.Cut into small pieces before serving. This is a non-fasting version. Bring water to a boil. Add sugar. Boil until sugar is dissolved. Add ground walnuts, cookies and butter. Mix until dough forms. Divide dough in half. Press dough onto an 8-by-16-inch piece of cardboard. A shirt box works well. Melt 4 ounces dark chocolate. Mix thoroughly with remaining dough. Spread chocolate mixture on top of light-colored dough. Flip the bajadera so the chocolate mixture is on the top and the light dough on the bottom. Melt remaining 4 ounces of chocolate. Spread a thin layer of melted chocolate on top of light dough layer. Refrigerate, uncovered, overnight. Cut into 1-by-2 inch rectangles before serving. Other photos of great Posno dishes, 2010. 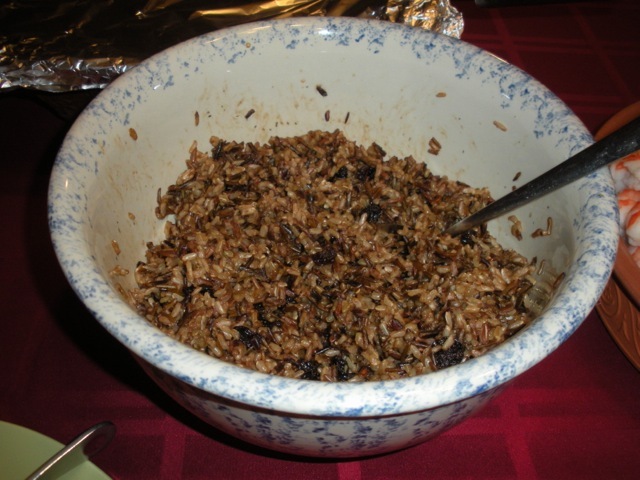 1 cup rice, cooked according to directions. 1 can tomato soup, diluted or large can of Tomato Sauce. To blanch cabbage leaves, core the cabbage head and insert large meat fork in center. Place head in boiling water in a dutch over for a few seconds until leaves can be easily removed. Remove all leaves that will be large enough to stuff. Cook rice as directed and drain. Saute onions in bacon grease (or butter) until soft. (You can also use chopped bacon here.) Mix meat, rice, eggs, onions together thoroughly. Season with salt and pepper and garlic, and Paprika or Vegeta. Place the filling in the cabbage leaves (one at a time) and tuck in the ends firmly. Rinse the sauerkraut and drain. Put 1/2 can of kraut on the bottom of the pot. Lay rolls neatly and close together. Make layers. Top each layer with 1/2 can of kraut. If you have any cabbage left, you can shred it and place on top of kraut. Pour 1 can of soup and 1 can of water (or large can of Tomato Sauce) over the cabbage rolls. If you have any smoked meat, place in sarma container too. Bake for 2 hours at 350 degrees until tender. Enjoy! This recipe came from the FACEBOOK Palachinka page with over 343,085 fans! U mlijeko umutite jaja, brašno, šećer i malo soli. Peći u tavi, na kraju staviti nadjev po želji. Prijatno! Mix milk with eggs, flour, sugar and salt. Bake in baking dish. Put jelly in the middle & roll! For at least the first 5 years of our married life, we used to have Palachinkas for breakfast on Saturday mornings! Joi! Update from Linda Porter, from the Masontown / Carmichaels, PA area. I wanted to let you know that I wanted to learn to make a Kolach for my Slava this Saturday and was having difficulty locating good directions for a beginner. I logged onto your website and found your recipe and instructions very easy to understand and the picture helped me to see what it should look like. I made it and it came out very good for my first try. However, Father Rodney said it has to be a fasting Kolach since we are in the Nativity fast. I put it in the freezer and tried it again with soy milk, and margarine and left out the eggs. It still looks similar to your picture and I am so happy and thankful for your excellent guidance! I hope you are well and I look forward to meeting you some day. If you recall, you sat with my husband at our Lenten Supper at St George last spring. Since then, I have sent your website to many people. You continue to inspire and you don't even know it! Thanks again and Best Wishes to You! She invented her own Posno Kolach! Here's Linda's 2nd Kolach- Lenten One! To view either Kolach larger, just select the lower right hand corner of the photo. Thank you so much for the pogacha recipe! I have just started making it...only have tried it twice and I was looking for other recipes to try. My mom is going to be 90 soon and she was searching her archives for any other ones that might be good. I will try your recipe for Christmas Eve 24th since we are having baccala. I will let you know how it turns out.. It is so nice of you to share your knowledge. Many people do not give out their recipes. I was never one of them....I feel that if you take it to your grave, no one will ever remember! When I make certain things that I have learned from my mom's old friends... Hungarian, Italian, etc...... I think of them fondly each time I make it! I share it with others only to tell them who it belonged to. Their memory is truly eternal in my kitchen. Thank you again. 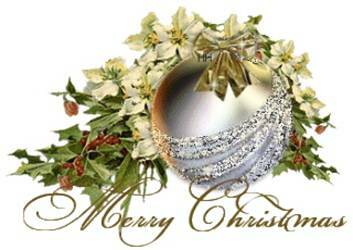 May you have a Blessed Christmas and a Happy New Year! Thank you again for helping me along my way. I remember you now, Linda! Thank you so much for letting me know the website is making a difference and that you're a cook FIRST CLASS! Only those brilliant ones know how to substitute! Good for you, girl! You invented a new POSNO Kolach! Add first 3 ingredients and stir to melt. Crumble yeast and let sit for 5-10 minutes to grow. Knead, then put in greased bowl and flip over. Cover the bowl and let it rise until double the size. The punch down shape and put it on a baking pan to rise again. Rub water on the dough and bake at 375 degrees for 35 minutes. "This POGACHA recipe is similar to the one I use that I got from the Srbobran years ago. I also replace one cup of white flour with whole wheat flour and add some ground flax seeds because I don't like to use white bread." "It's really simple. Just use equal parts of butter, sour cream, and Feta cheese!" He comes from not only a Musically talented family, but one with incredible cooks too! The Johnstown, PA newspaper, the Tribune-Democrat, did an EXCELLENT job in covering Johnstown's SERB FEST 2010 (July 31-Aug. 1, 2010) which featured a guest appearance of author Gregory Freeman, (The Forgotten 500) at the War Memorial Arena in Johnstown, and at the Serbian Church picnic grounds the following day. This event was sponsored jointly by the Bottleworks Ethnic Center and the St. Nicholas Serbian Orthodox Church in Johnstown. We feature here several recipes that appeared in the newspaper on Sunday, July 25, 2010. Once again, "THANK YOU" to the Tribune-Democrat for such excellent coverage in all areas of Serbian history and culture that truly helped make the event so successful! They KNOW what a COMMUNITY NEWSPAPER is! Continued success Tribune-Democrat, in all of your endeavors! In shallow dish, combine eggs with milk, honey and salt. Add bread slices, one at a time, to egg mixture. Coat each side completely. Fry until golden brown on both sides in small amount of butter. Combine remaining honey, lemon juice and 2 tablespoons butter. Heat. Serve over toast. Drain pineapple and save syrup. In mixing bowl, combine cream cheese, cottage cheese, 1/2 cup sugar, egg yolks and whole egg, lemon peel and vanilla. Blend together on medium speed. Stir in drained pineapple. Place filo leaves between dampened towels to keep moist. Place a sheet of pastry in greased pan (9x13x2-inch). Brush with melted butter. Repeat process with 4 more leaves. Spoon on the pineapple-cheese mixture and spread level. Top with remaining filo leaves, brushing each sheet with melted butter as it is layered. Use sharp knife to carve diamond shapes in top of pastry. Bake at 350 degrees about 50 minutes or until golden brown. Combine 1/2 cup reserved pineapple juice, remaining 1/2 cup sugar and lemon juice. Cook to thick syrup. When Baklava is baked, spoon hot syrup evenly over top. Cool and cut into diamond shapes and markings. Sauté onions slowly in milk on low. Stir frequently so it does not burn until milk is absorbed. Cool slightly; add meat, vegeta, eggs, salt and pepper. Use 4 sheets of filo dough. Spread lightly with melted butter on first sheet and sprinkle with bread crumbs. Take third sheet and place 1/2 in center and the other 1/2 will overlap. Take fourth sheet and place on the other side of the third sheet. Sprinkle with bread crumbs and fold over filo dough. Fold both in and roll. Brush top with melted butter. Place on greased cookie sheet and bake at 350 degrees for 45 minutes or until golden color. May be frozen before baked. Mix first 4 ingredients. Add remaining ingredients and mix well. Pour batter into a greased 9x9-inch pan and bake at 425 degrees for 25 minutes or until nicely browned. Peel eggplants and cut in 1/4-inch lengthwise slices. Sprinkle with salt and let stand 15 minutes; dust with flour. Then dip in 5 eggs, beaten and brown on both sides. Set aside. In skillet, cook onion. Mix meats, 2 eggs, bread crumbs, 1/2 teaspoon salt, pepper and garlic. Add to onion; cook lightly until browned. In saucepan, melt butter in 6 tablespoons flour. Add milk and cook until smooth. Line a 3 1/2- to 4-quart roasting pan with layer of eggplant and meat mixture. Repeat layer, ending with eggplant. Pour sauce over top; heat in 375-degree oven for 1 hour. Cut in squares. Serve with sour cream if desired. 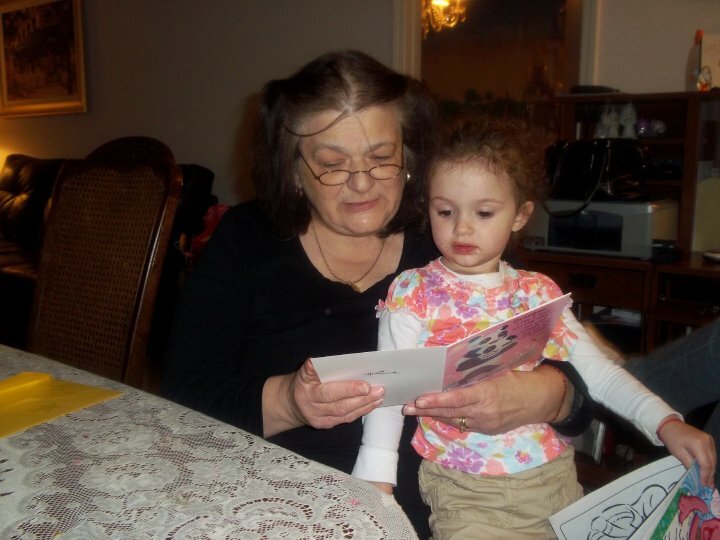 Vera & her granddaughter, Jelisaveta, on Baba's birthday! Jelisaveta is the daughter of Vera's daughter, Mirjana. Being a great Kuma besides a great cook, Vera was happy to oblige! 1.Mix cream cheese and butter until light and fluffy. Add flour 1 cup at a time and mix well. Wrap dough in plastic and refrigerate for at least 1 hour. 3. Bake for 15 minutes or when corners start to brown. Cool and dust with confectioners' sugar. these tend to become soggy if held for several days, so store them tightly covered (or freeze) without confectioners' sugar. Dust with confectioners' sugar just prior to service. 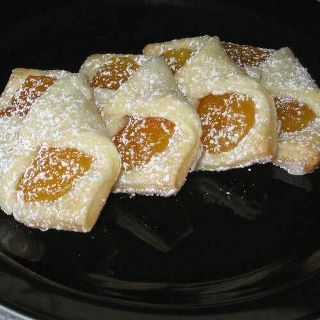 Recipes are for sharing, and here is a Nut Kiefel recipe from Serb World's Nov./Dec. issue, 2011 on p. 31. It was shared by Nettie Baltic, who comes from a family of great bakers. I posted this so I could always have it handy myself! Separate the 4 eggs. Comibine the butter and flour as if you were making a pie dough. Slightly beat the egg yolks. Add yolks and sour cream to the flour mixutre. Mix well to form dough. Divide the dough into 5 or 7 balls of equal size. Wrap each in waxed paper and chill in the refrigeration for 1 hour until firm. In the meantime, prepare the walnut filling. Grind the walnuts. Slightly beat the whole eggs. Beat the egg whites until stiff peaks form. In a mixing bowl, combine the walnuts, sugar and whole eggs well. Mix in flavoring. Then gently fold in the beaten egg whites untill well blended throughout. On waxed paper, roll each piece of dough out into a circle. Spread with filling. Cut into pieces like cutting a pie. Beginning at the wide edge, carefully roll up each section, ending with the narrow end. Bake on cookie sheet at 350 degrees for 11 to 15 minutes or until light brown.